With the many items Rev. Lindesmith sent to the museum, he also sent his explanations and commentary on the different items and how they related to his experiences. Lindesmith’s descriptions show not only what happened in Montana, but also his perceptions of the people he encountered. 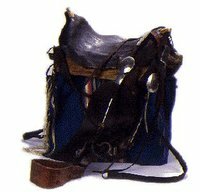 case, buckskin AN1996-198 This buckskin cover over the pouch containing the Holy Oils, Ritual, stole and Pyx, I received in this way. namely July 10, 1881, on a month’s mission at Ford Buford, North Dakota Territory, on the junction of the Missouri and Yellowstone rivers. In the log cabin of the parents I baptised William, born March 3, 1880. Father of the child James Frederick Mulligan of Dublin, Ireland; a Union soldier of the Civil War, lately an honourably discharged soldier of the regular army, at present a US mail carrier; and of his lawful wife, mother of the child, Gawe-chepek-esque-mat, in English : the one that the Spirit spoke to. Sponsors: John Walsh, Irish private soldier, Co. A.,7 Inf. USA, and Elizabeth Scott, native of Indian Territory of Scotch parents. The father gave me ten dollars. The mother, seeing the poor cover I had over the pouch, handed me this buckskin cover, saying: This will cover the Holy things better than the old cover. I believed her and used it ever since. The judgement of the Indian squaw is true, buckskin is better than cloth. The moral of it: A good name, a good character, a good faith, the true Christain religion, the love of God, the love of one’s neighbor, the love of our country is a better cover for a man’s soul than the old bad character, the old bad name, the old bad morals, the old bad opinion, the imperfect religion, the old coldness for God, the old hatred of one’s neighbor and bad citizenship. To the Reader: What do I think about it? Is my judgment as good as that of the Indian squaw? Crucifix, mission AN1996-213, 1996-213.2 I bought it of Henry Kramer for 25 cents. I made a movable pedestal for it, because at some places it had to stand on the Altar, at other places it was neccessary to hang it up, if so I removed the pedestal. In my travels in the Rocky Mountains it got broken, but I repaired it by glueing and nailing it to gether again and made it stronger than ever. That is the way to do in all our temporal affairs. When something gets broken, injured or out of repair, be sure to repair and mend it at once. Try to make it stronger and better than ever before. That is also the way to do when our soul, our conscience, our morals get injured, broken and out of Christian repair. Be sure at once to repair and mend by sorrow, repentence, prayers, strong resolution of amendment, fasting, alms deeds, a good confession and Holy Communion. If you do so, you will be as good and even better than ever before.What do I think about mending? Jan 1912 I gave it with the sacristy to the museum. “Fort Keogh, Mont. July 17, 1882. This is what is called among the Cheyenne Indians an excellent saddle. I bought of Brave Wolf, who is a very interprizing (sic) Indian. He has been a government scout. He is a very successful farmer. He wears white man's clothing, but still holds on to his long hair. The saddle tree is partly made of elkhorn. I saw many made of the same. Brave Wolf likes to trade and sell. He buys of the indians and sells to white men, and then he sells to indians what he buys of white men. If he had been raised among white men, he would have made a first rate business man. It is only five years since he gave up the savage life. He is forty years old. I paid him 7 dollars for the saddle.” E.W.J. Lindesmith, The Catholic University of America Anthropology Collection 1996-181.